Last week, following a similar incident in St. Louis, Vice President Mike Pence visited the site and said, "there's no place in America for hatred or acts of prejudice or violence or anti-Semitism." Mayor Kenney, Governor Wolf, and Senator Casey have all spoke out condemning the lastest vandalism in Philadelphia. There were already people gathering at the cemetery today righting the smaller tombstones. The Mizel Family Foundation, through the Anti-Defamation League, is offering a $10,000 reward for information that leads to an arrest and conviction. The Fraternal Order of Police Lodge #5 is offering an additional $3,000. 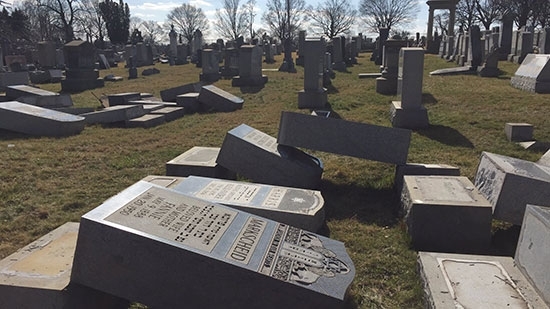 The Jewish Federation of Greater Philadelphia is collecting donations for repairs to Mount Carmel Cemetery at www.jewishphilly.org/donate-now-mt-carmel-cemetery. Ahmadiyya Muslim Community USA has also condemned the vandalism and offered to send help in a press release. Mt. Carmel Cemetery has been open since the late 1800's. Two off-duty Dover police officers were killed early Sunday morning in a single car crash in Dover, DE. They have been identified as 23-year-old Patrolman Robert DaFonte, a two-year-veteran of the Dover Police Department, and 22-year-old Cadet James Watts, a six-month member of the Special Enforcement Cadet Unit. (see photos below) It happened around 4 a.m. on Hazletville Road near Nault Road. DaFonte was driving a 2016 Jeep Wrangler. The vehicle went off the road at a sharp curve. It travelled down an embankment and struck a telephone pole. Watts was sitting in the passenger seat and was ejected from the car. He was not wearing a seatbelt. DeFonte was wearing his. They both were pronounced dead a the scene. The Collision Reconstruction Unit is still investigating the cause of the crash. "It is with great sadness and a heavy heart that we announce the tragic loss of two members of the Dover Police Department family. Officer Robert DaFonte and Cadet James Watts were outstanding employees and were committed to serving the citizens of Dover," Deputy Chief Marvin Mailey said in a statement. 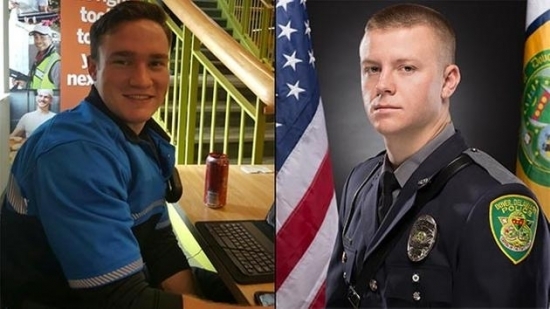 23-year-old Patrolman Robert DaFonte, a two-year-veteran of the Dover Police Department, and 22-year-old Cadet James Watts, a six-month member of the Special Enforcement Cadet Unit.